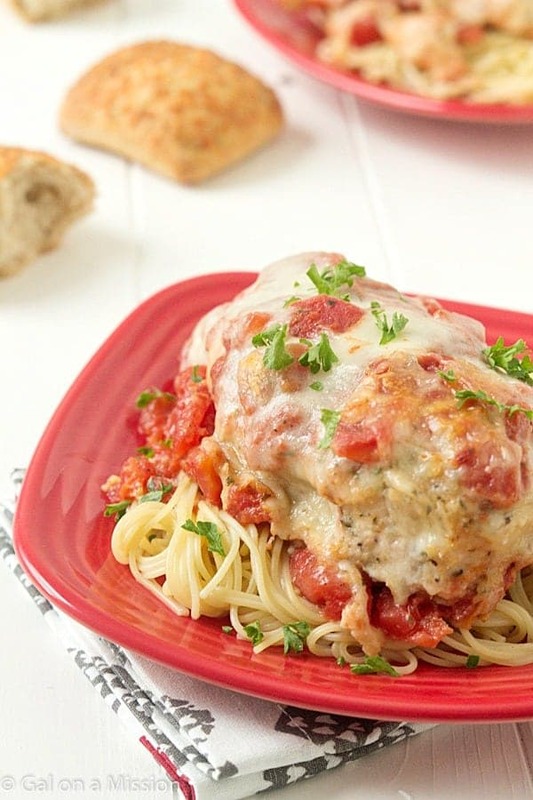 Easy Chicken Parmesan: Moist and juicy chicken breasts coasted in breadcrumbs, mixed with Italian seasonings; then topped with diced tomatoes, Parmesan cheese, and fresh mozzarella. Let’s talk about Valentine’s Day today, my friends. Are you the type who loves to create a delicious home-cooked meal for or with your loved one? Or would you rather go out and hope to find a reservation at a restaurant? Ever since my husband and I have been together, we have always created a romantic dinner at home. Some years I make it and others we make it together. Trying to find a restaurant where we live is a nightmare, way too populated and everyone seems to go out. The prices are also a deal breaker for us. You can create a beautiful meal at home for a fraction of the cost; even with the same quality meats, appetizers, and cocktails. 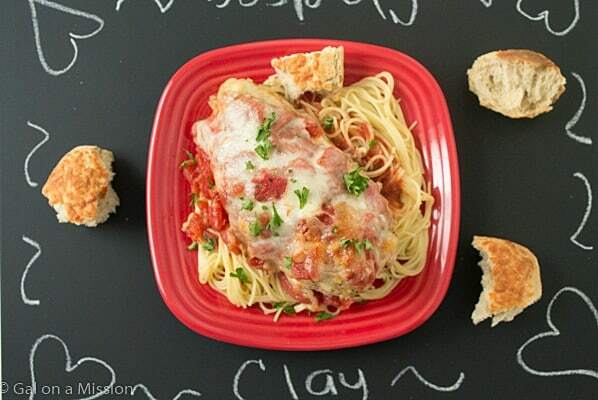 That’s where this easy and delicious chicken Parmesan recipe comes into play! If you are thinking about your plans for Valentine’s, I highly suggest you trying this recipe at home. You can eliminate the stress of finding a reservation and enjoy each other’s company at home in a quiet and romantic environment. Chicken Parmesan is typically an easy dish to make, but this version is much easier. Instead of making the tomato sauce to top on the chicken breasts, we used Hunt’s Diced tomatoes in a rosemary and oregano flavor. We always seem to have plenty of canned tomatoes in our pantry. Already flavored diced tomatoes are perfect and helps to cut the kitchen time down a little bit, so you can enjoy each other’s company more. Another delicious shortcut we took is by purchasing Alexia Artisan Focaccia Bread Rolls coated in asiago and Romano cheese, which are a great option because they are a line of premium all-natural breads. Did I mention how tasty they are? Not only can you find the Alexia Artisan Focaccia Rolls we used, but there are so many more options! There really is no better gift than creating a delicious home-cooked meal for or with your loved one. You can also visit Laura in the Kitchen’s YouTube Page for more delicious and simple #VDayIn recipes! By the way, I might be drooling over this Pasta with Pancetta & Cherry Peppers Recipe! Share the love on Hunt’s® Facebook and Alexia® Foods Facebook! Are you looking for even more great #VDayIn recipes you can join me and some of my favorite blogging pals for a Twitter party by @inspiredbythis @tasteandtell on February 11th, 2015 from 1-2 PM EST. Preheat oven to 350 degrees. Mix together the breadcrumbs, oregano, basil, salt, and pepper on a medium-sized plate. Coat each chicken breast in the egg, then into the breadcrumbs, Making sure each part of the chicken is coated. 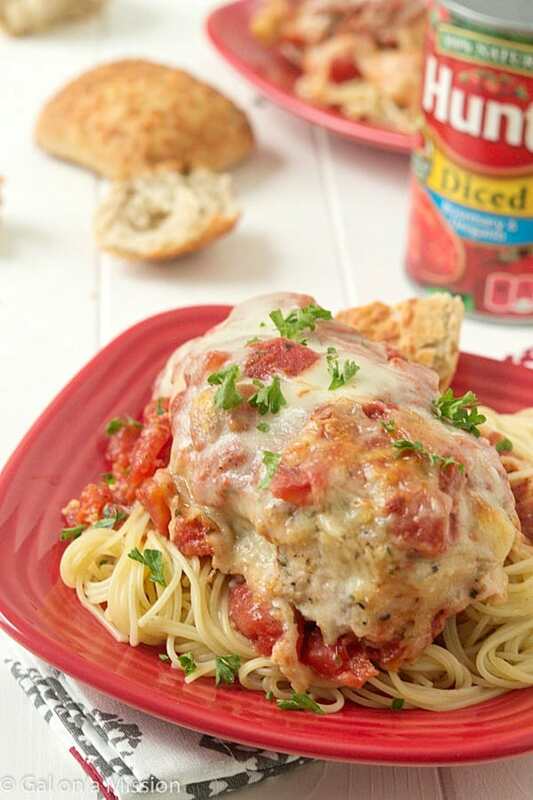 Add ¼ of the diced tomatoes onto the bottom of a 8x8 baking dish, place the chicken breasts on top of the tomatoes. 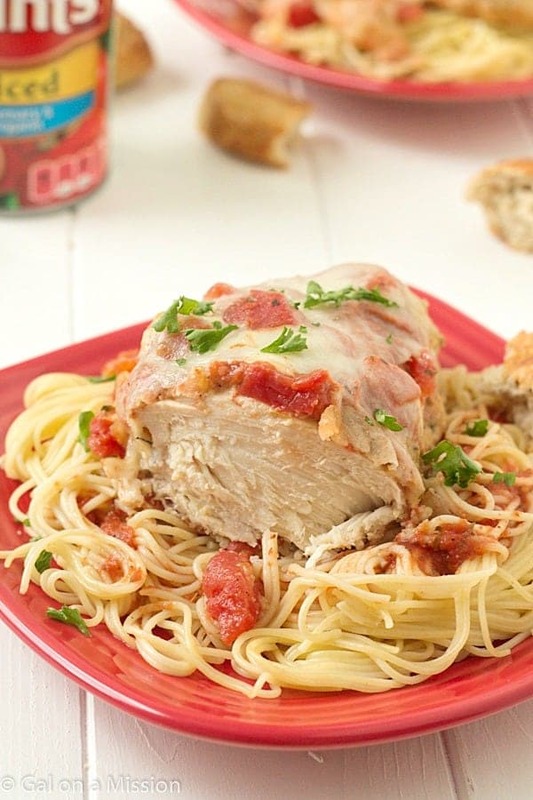 Spread the rest of the diced tomatoes on top of each chicken breasts, add the parmesan cheese on each chicken breast, then place the pieces of fresh mozzarella on top. Bake 30-40 minutes or until the chicken is fully cooked. 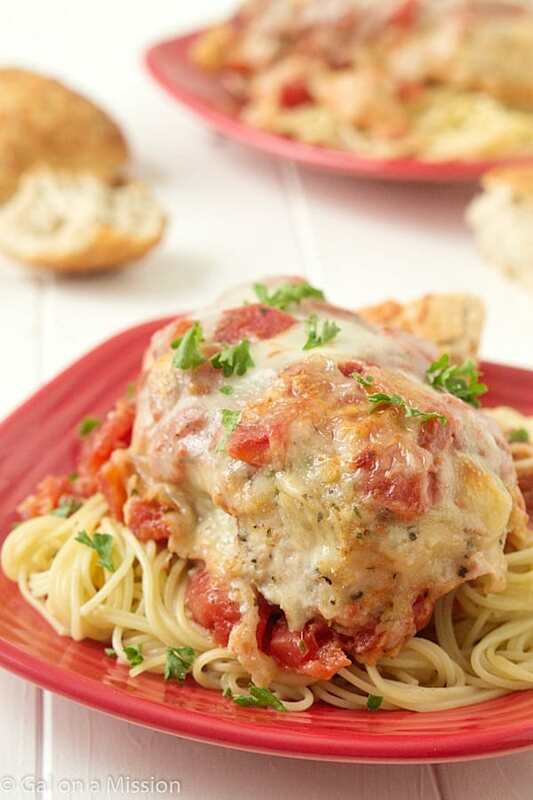 Serve the chicken on top of the angel hair noodles, then garnish with basil or parsley. Great question, Cathy! The breading wasn’t very thick to begin with and I did not notice the chicken being soggy at all. LOVE this recipe! Many of the other chicken recipes I have tried have come out dry, but not this one! I was wondering if you could freeze this recipe, thaw, and then bake as instructed? I ususallly cook dinner and I am going away for a week long conference. I still want my family to have meals to eat other than plain pasta, cereal, or takeout and am considering freezing 5 dinners for them. So, would this one freeze well? I am so glad you enjoyed it, Leighann! I haven’t tried to freeze this dish before, so I am not sure what the outcome would be. Please let me know how it turns out if you decide to freeze it!